The theme for this month’s Wine Pairing Weekend is American Wine for an American Holiday. Thanksgiving is fast approaching and it is just about my favorite holiday, so I’m happy to put together a paring around a Thanksgiving theme. This will be a paired-down pairing with three wines made by the Mercer family from Washington state. The Mercers were kind enough to send us the wines as tasting samples, and I think the wines will be a perfect fit for my pairing and the theme. I love the food, the gathering of friends and family and the challenge of pairing wines with Thanksgiving dinner. I enjoy making the meal as much as I do being a guest at such a meal. But, preparing a large meal for just two can become just too much of a good thing. So, with this in mind I’ve prepared a small meal with just our favorite things. The only thing that was missing was pumpkin pie. I will have to wait until Thanksgiving Day for that treat. Two people, three wines. Yes, it’s true that this ratio is not in keeping with my theme of a paired-down pairing. But, just as our meal provided delicious leftovers, so to did the wine. I am embarrassed to admit that I am not very familiar with Washington state wines. When we were contacted regarding these wines I did not recognize the Mercer name. 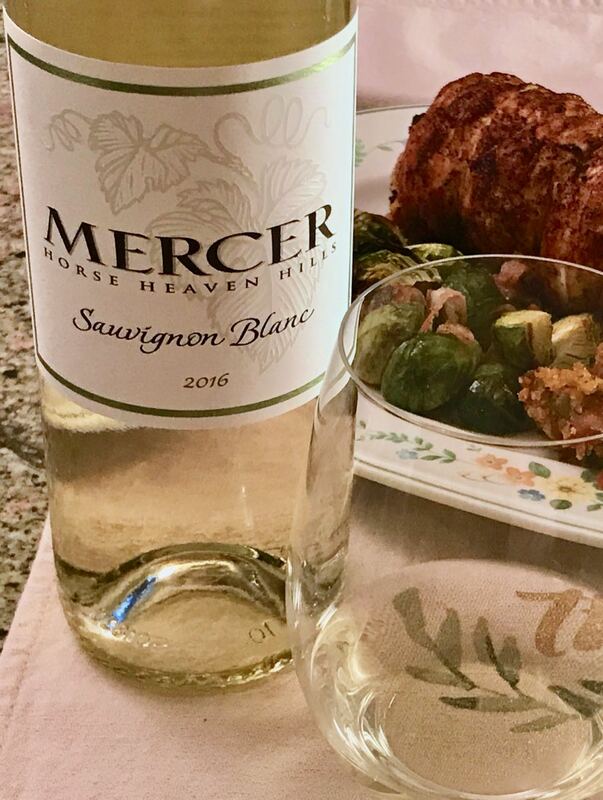 As I read about the family and their long farming history in south eastern Washington I was intrigued and wanted to learn the history of Mercer Wine Estates, and to taste their wine. The Mercer family has been farming in Washington state since 1886 when Willis Mercer settled in Prosser in what was then Washington Territory. Washington statehood would not come for three years. Between 1886 and the late 1950s the Mercer family was involved in sheep herding, cattle ranching and drylands wheat farming. In 1969, irrigation was introduced to this arid portion of Washington state and with water came row crops, orchards and vineyards. Mercer family farming interests grew to include diverse row crops and vineyards. In 1972 Don and Linda Mercer planted the first vineyard in what would become Horse Heaven Hills AVA. Rob and Brenda Mercer founded Mercer Wine Estates in 2005. The hard work continued and the accolades just behind them. In 2011 Don and Linda Mercer received the Lifetime Achievement Award from the Washington Association of Wine Grape Growers and Mercer Wine Estates was named Washington Winery of the Year by Wine Press Northwest in 2016. 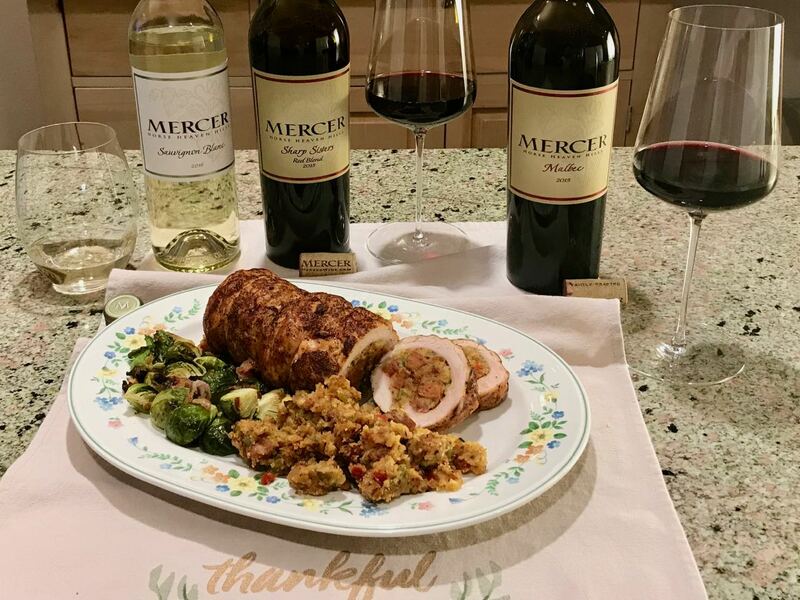 Mercer Wine Estates produces three tiers of estate wines and one wine entirely for charity: Mercer Estates, Mercer Estates Reserve, Mercer Canyons and Eagle & Plow. The three wines we received as tasting samples are from the Mercer Estates range. This 100% Sauvignon Blanc was pressed gently and fermented in stainless steel. It has just enough of an herbaceous note to identify it as Sauvignon Blanc, but it’s not just herbaceous. The tropical fruit flavors lend complexity to this very refreshing Sauvignon Blanc. This delightful red blend includes 29% Cabernet Sauvignon, 27% Syrah, 18% Merlot, 14% Petit Verdot, 10% Grenache, 2% Carignane. It’s what I call an everybody in the pool blend. Fermentation took place in French and American oak and was aged for 18 months prior to blending. This is a satisfying red wine with considerable depth and character. It will please a wide range of palates. 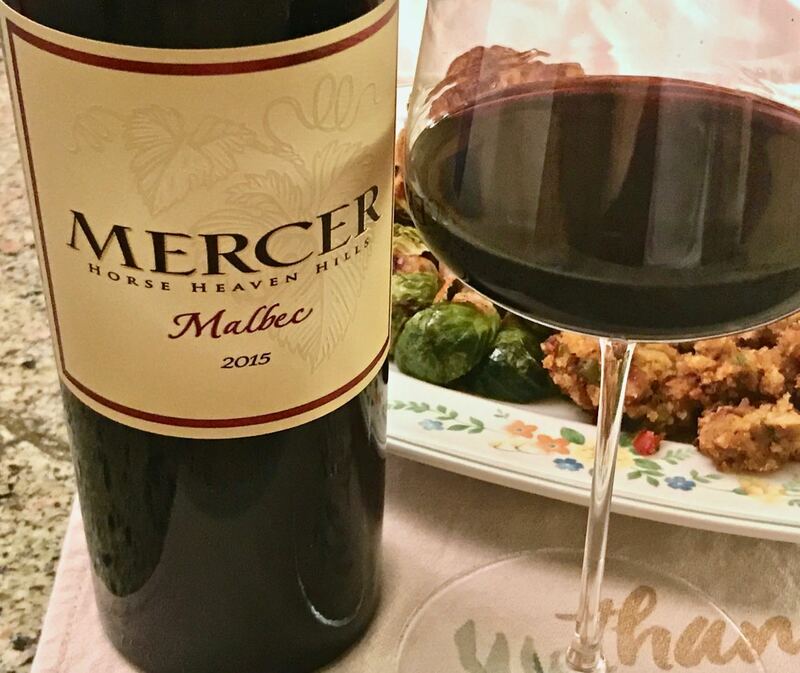 2015 Mercer Estates Malbec — dense ruby-violet in the glass with generous ripe blueberry and crushed flower stem aromas. Flavors lead with cedar, ripe black berries, blueberries and dusty earth. Grippy tannins support the flavors and linger, along with cedar, on the very long finish. 14.8% abv. 950 cases produced. SRP $19.99. 22% Cabernet Sauvignon is blended into the Malbec for this bottling. Both varieties were fermented separately in new and used French oak barrels and aged for 18 months before blending. This is a lovely Malbec, even if it includes a fair amount of Cabernet. All of these wines offer tremendous quality for the price. 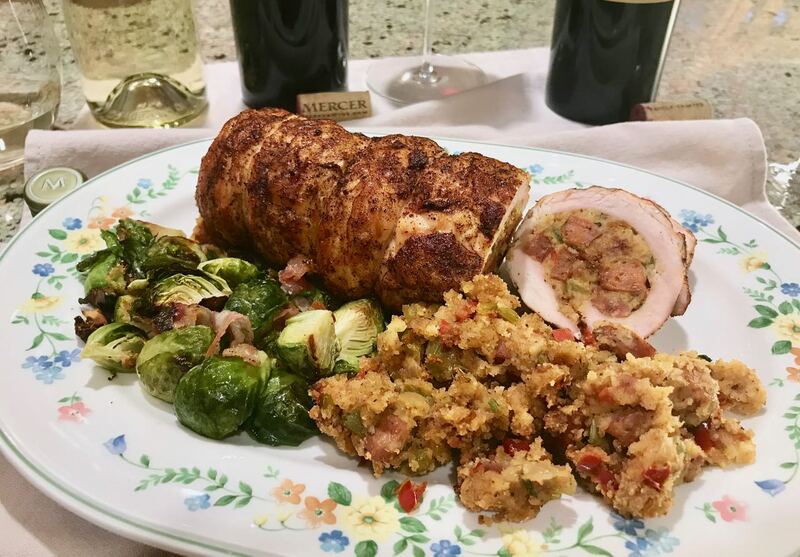 Since successfully preparing a stuffed pork loin some time ago, I have been wanting to try a stuffed turkey breast. I looked at several recipes to get a general idea of how to prepare one, then decided to do so using my favorite Thanksgiving turkey dressing recipe. It was a great success, and I no longer feel the need to roast a whole turkey for Thanksgiving. Pete and I have come to love this dressing since I first prepared it in 1999. I know the date because the recipe is from the November 1999 issue of Bon Appetit, which remains on our bookshelf with the cookbooks. I’ve made it most years for Thanksgiving since then. It is very different from the dressing either of our mothers prepared, but it has become our traditional Thanksgiving dressing. Prepare and bake Krusteaz Honey Cornbread Bread Mix according to package instructions. Cut into 1-inch squares and allow to cool completely. Melt butter in a large dutch oven and sauté both sausages until fully cooked. Break up the bulk sausage into small pieces. Add onions, celery and red bell pepper. Mix, cover and cook until vegetables are tender. Stir occasionally. Stir in green onions, thyme, hot pepper sauce and sage. Transfer to a large bowl and allow to cool. Stir cornbread mix into the sausage mixture. Season with salt and pepper. Add enough turkey stock to moisten the dressing mixture. Butter a 13x9x2 baking dish. Transfer dressing to prepared bowl. Cover with buttered foil, butter side down. Uncover and bake until the top is just crisp and golden. Carefully remove the skin from the turkey breast keeping it in one piece. Place turkey breast flat on a cutting board. Holding the knife parallel to the cutting board, slice almost all the way through the turkey breast. Open the breast like a book. Place the turkey breast between two sheets of plastic wrap and pound using a meat mallet to an even thickness of 1/2 to 3/4 inch thick. Remove turkey from the plastic wrap and season both sides with salt, pepper, chili powder and paprika. Spread the dressing evenly over the turkey leaving 3/4 inch border all the way around. Roll the turkey breast over the dressing creating a uniform log. Wrap the turkey skin around the roll to cover the seam. Tie the rolled turkey breast at one-inch intervals. Season the turkey skin with salt, pepper, chili powder and paprika. Place in roasting pan, seam side down, and roast until internal temperature reaches 155 º F.
Remove from oven, cover with foil and allow to rest for 15 minutes. Internal temperature should reach 165º F.
The richness and spiciness of the andouille sausage made it a great match for both red wines. Turkey breast on its own would not have paired so well with red wine, but the flavors of the dressing infused the turkey with lots of flavor so the pairing worked very well. The Sauvignon Blanc provided a cooling counterpoint to the heat of the dressing and was nice to sip as I prepared our meal. All three wines held up very well over several days. We refrigerated the Sauvignon Blanc and held the red wines, corked with rubber stoppers, at room temperature. 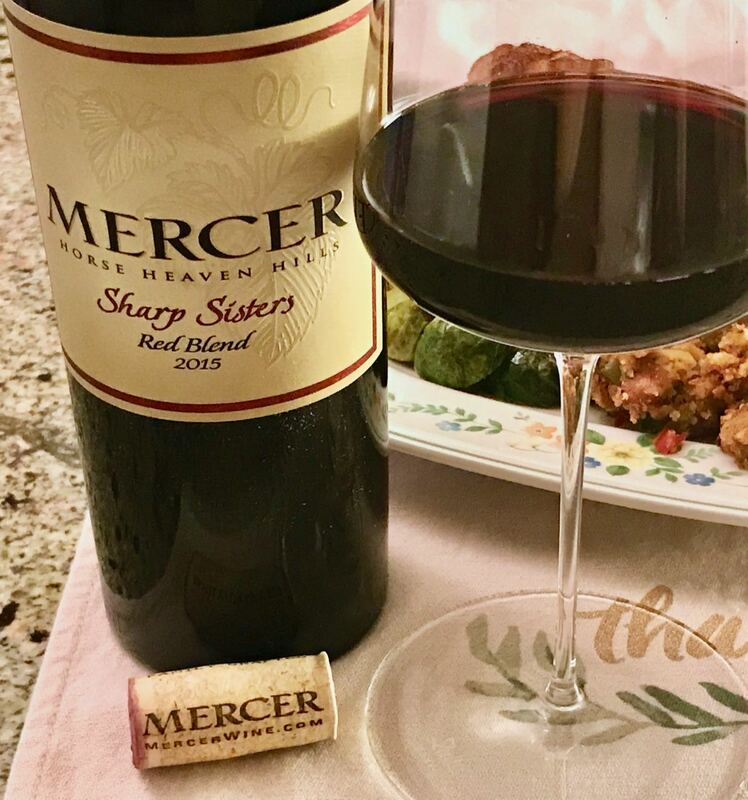 Thank you to the Mercer family for sharing your wine with us. Wendy Klik, who blogs at A Day in the Life on the Farm, is this month’s host. Her preview post announces the theme and gives you some background on why she chose it. Other members of our group have put some American wine pairings together for your consideration. Looks like interesting reading. Culinary Adventures with Camilla is Celebrating an American Holiday with Two Bay Area Darlings: Cowgirl Creamery + Donkey &Goat Winery. Wine Predator enjoyed American Wine, American Meal: Duck with Napa’s Duckhorn Merlot. L’Occasion is sharing 5 American Wines for Thanksgiving. Cooking Chat will be sharing Roast Turkey Breast with Cranberry Merlot Sauce. A Day in the Life on the Farm will be discussing Holiday Leftovers; Mediterranean Chili with an American Wine. Please join our chat on Saturday morning, November 11, at 8am Pacific Time on Twitter by using the hashtag #winePW. We’d love to have you join the conversation. I’m a big fan of Washington wines since 2010 when I did a press trip before WBC10 in Walla Walla where of course we tasted a lot of Washington wine too! You should definitely go to WBC18 when it goes to Walla Walla again! And thanks for the recipe — this is something my family WOULD LOVE! that stuffed turkey breast looks impressive! Sounds like some good wine for it too. Added you to my list of links. I am impressed you did this what attending WBC17. The meal and wines look delicious. Great to see you and Peter. Hope you have a wonderful holiday season. I am woefully unfamiliar with Washington wines. Maybe that will be a new year’s resolution. I will start with Mercer if I can find them here. This is a beautiful meal – yes, it has all the flavors of Thanksgiving AND it has the elegance of a dinner party. This could work for a New Year’s Eve meal too. I love the delicious versatility of Sauvignon Blanc. It is so lovely with food or an apero. Mercer Estates sounds like a winery to know. I bet they have some great stories to tell. Horse Heaven AVA – what a name! Nancy, I love the sound of that dressing with Andouille sausage. I am going to keep an eye out for Mercer wines. I like the idea of roasting a stuffed turkey breast for Thanksgiving – especially if it’s going to be just my husband and me. Thanks for the recipe! And the wines sound nice, too. It was fun to try something different. Cheers, Lauren!